Passing & Turning has always been a necessary technique but becoming more critical to perform under pressure with greater speed in the modern game. The ability to turn, in either direction in control of the ball allows for more penetration between and behind lines of defense. Without it, creating opportunities to get into the Attacking 1/4 or inside the penalty box decreases. Organization: 4 Players with 2 balls being used inside of an area which is based on the players age and ability of passing range. The higher the technique ability the smaller the area to increase the speed of play. Avg. size would be 12x12yds. Starting Point: The balls must start in the corners of the same side. After a pass to the central player always run to your right. Player A starts the play by passing (#1) to Player B and runs to the next corner. 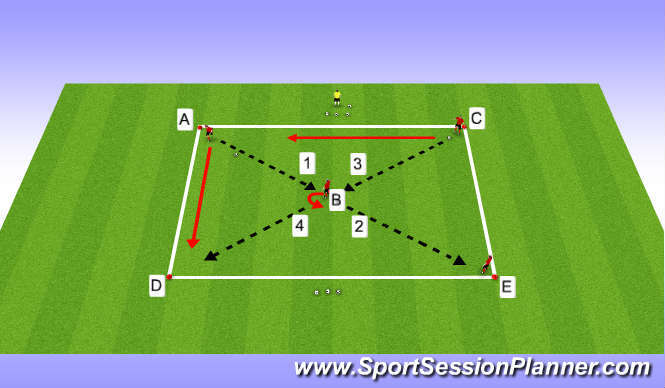 Play: As Player B receives the ball, s/he turns with it and plays a pass (#2) to Player E. Player C then passes (#3) to Player B who turns and passes (#4) to Point D where Player A would have advanced to. Player C would run to Point A which was left vacant by Player A. The central player is always receving the ball to play to the corner behind him/her. One corner is always open to run to after a pass is made centrally and the player has turned to pass to the opposite corner. Coaching Points: Player B should be positioned to receive the ball 1/2 turned/sideways on (always be able to see back and forward. Players should scan forward and back before receiving the ball to create awareness of options and space/time available. Receive with one foot and turn in the direction of the foot being used to control the ball without stopping it and play an accruate pass with the opposite foot all in one motion. The less touches on the ball the better. Allow for the player in the middle to have 3 full rotations before changing them with a player on the outside. Repetition is the key. Use of both feet to turn in either direction. Turn in the opposite direction (left) have players run to their left.